Smoother, younger-looking, and more evenly toned skin can be achieved without ever having to undergo a surgical procedure. Our double board certified facial plastic surgeon, Dr. Eugenie Brunner, utilizes the most advanced facial rejuvenation techniques available, including the Eclipse MicroPen® Elite. This innovative device is designed to provide noticeable improvement in many common signs of aging, particularly when combined with Platelet-Rich-Plasma (PRP) therapy. Furthermore, the treatment typically will be swift, with little downtime required. If you’d like to refresh your appearance but aren’t ready for surgery, the Eclipse MicroPen® Elite with PRP therapy may be right for you. Our cosmetic treatments are customized to suit your needs and goals. To find out more about the Eclipse MicroPen® Elite and its benefits, contact us today. We can answer your questions or help you schedule a consultation with Dr. Brunner. Your anatomic needs and cosmetic goals are unique, which is why we will customize a treatment plan tailored to your desired outcome. When you arrive for your initial consultation, we will discuss your areas of concern. Micro-needling combined with PRP therapy can address many issues, including fine lines and wrinkles, acne scars, hyperpigmentation, uneven skin tone and texture, mild skin inelasticity, and more. If requested, we can also include additional aesthetic enhancement options such as laser treatments and Fractora® RF rejuvenation for more comprehensive revitalization. Before we begin the micro-needling treatment, we will collect and prepare PRP to use in combination with the MicroPen® procedure. We will draw a small volume of blood from you and remove the red blood cells. Our process results in Platelet-Rich-Plasma, a substance that stimulates growth factors that can repair tissue, promote cell growth, and encourage skin regeneration. We will apply this serum to the area to be treated and then administer the Eclipse MicroPen® Elite. Additional PRP will be brushed on the skin during therapy as well as after it has been completed. 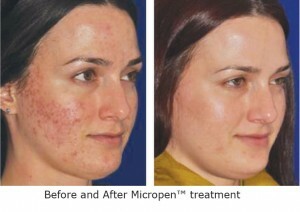 The Eclipse MicroPen® Elite uses automated micro-needling to create tiny channels in the skin. This process is also known as collagen induction therapy, or CIT. These micro-injuries prompt the body to repair itself, generating fresher, younger skin cells in the treated area. PRP boosts the body’s recovery response, helping to further minimize common signs of aging, hyperpigmentation, and facial scars. Treatment typically will be quick. The micro-needling portion can take as little as 15 minutes, depending on the number and size of the areas you wish to address. Discomfort should be minimal, as the ultra fine needles work rapidly. Many patients report that the sensation is similar to having fine sandpaper brush the skin. To help make your experience as pleasant as possible, we will utilize a hydrating gel and numbing solution. Once the procedure is complete, you can return home immediately. You will notice some mild swelling, tenderness, and redness in the treated area, and these effects should subside over two to four days. If it increases your comfort, you’re welcome to wear makeup to cover any redness until it fades. A single session of micro-needling combined with PRP therapy can provide significant aesthetic enhancement; however, several sessions may be necessary to achieve your desired outcome. We will discuss your treatment plan during your initial consultation. For more information about the Eclipse MicroPen® Elite, micro-needling, and PRP therapy, please contact our office today. We can answer your questions and help you schedule a consultation with Dr. Brunner.